Brad Fuller and Andrew Form first told CHUD they aren't sure it will even happen. Andrew Form said, "I don’t know if we have the time to be ready for it. If it does all happen, it’ll happen quickly because the film does need to shoot before the winter does come and cause the date would be summer next year." 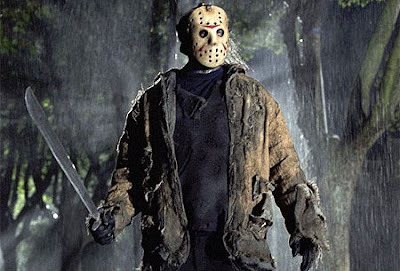 Clearly the producers would once again shoot for a Friday the 13th opening in August of next year. They next shared that their idea was to bring the sequel to theaters in 3D, which could pose more potential time constraints. Form explained, "We’ve talked about how much time to get ready for the 3-D and then how much post time you need which is a lot longer than a non-3-D movie to get it into the theaters and then financially. But I mean from day one when we started talking about the sequel we talked about it being in 3-D." Ehh, I could care less if the film is in 3D or not, personally I just want to see more of what they started over. Furthermore, shouldn't part 3 be in 3D anyways like the original series? Fuller and Form next said that they would really like to bring something new to the sequel that Friday fans haven't seen before. You ask what they may be. Fuller explains, "One of the things that they haven’t seen before is Jason in the snow. They haven’t seen that before." Jason in the snow? Really, I guess I could see Crystal Lake covered in snow. Fuller quickly added that the film won't be entirely set in the snow. "I can tell you this, the movie itself will not take place in the snow. I don’t want to sit in Winnipeg with [Andrew] for two months in the snow. We did that once, I don’t want to do it again," Fuller joked. CHUD questioned that this idea could be another possible prologue, which could be a real nice treat. Finally the producer duo told CHUD that they intend to address some of the fans complaints about "the kills" in the sequel. "We can bring more clever kills to the second one, that’s what we’re going to do. [But] I don’t think that turning him into a space-going astronaut would be the direction that we’re going to go in," Fuller expressed. Thank god for that!